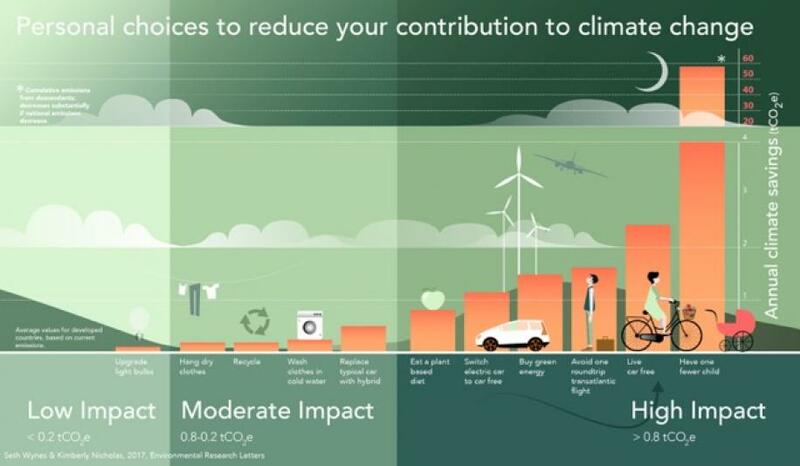 A new study has identified the four actions that would have the greatest impact on an individual’s greenhouse gas emissions: eating a plant-based diet, avoiding air travel, living car free, and having fewer children. The comprehensive study analysed 39 peer-reviewed articles, carbon calculators and government sources to quantify the most high-impact personal lifestyle choices in developed countries. “There are so many factors that affect the climate impact of personal choices, but bringing all these studies side-by-side gives us confidence we’ve identified actions that make a big difference". "Those of us who want to step forward on climate need to know how our actions can have the greatest possible impact. This research is about helping people make more informed choices,” says lead author Seth Wynes. To put this in context, per capita carbon dioxide emissions should not exceed 2.1 tonnes annually by the year 2050 - if the goal of limiting the global temperature increase to well below 2ºC is to be achieved. Kimberly Nicholas, associate professor at Lund University Centre for Sustainability Studies and study co-author, says, “We recognise that these are deeply personal choices. But we can’t ignore the climate effect our lifestyle actually has. Personally, I’ve found it really positive to make many of these changes. It’s especially important for young people establishing lifelong patterns to be aware which choices have the biggest impact. We hope this information sparks discussion and empowers individuals,” she concludes. Dr. Jonathan Foley, director of the California Academy of Sciences, commented: “Institutions also need to be leading by example. We need to use our positions to showcase climate leadership, and amplify positive individual actions across society.” The Academy announced that they will achieve net zero greenhouse gas emissions by 2025, the first major science museum to do so.